It’s called a “Propylene-Propane Splitter” distillation column, and its job will be to help make plastic out of propane. 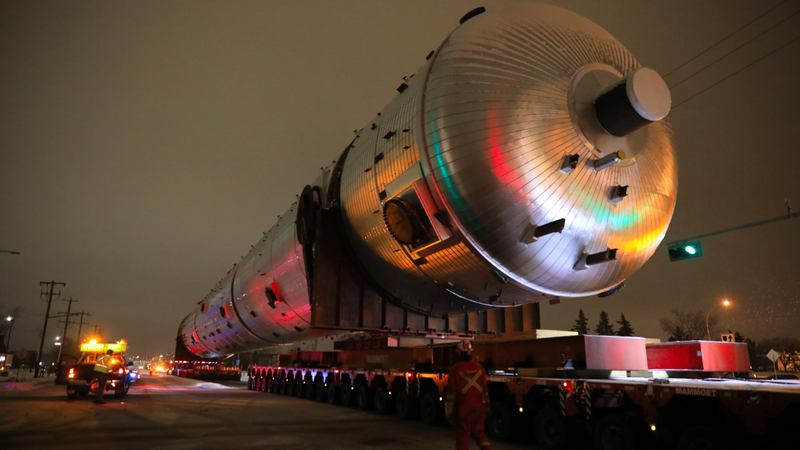 It weighs nearly 900 tons, stands over 300 feet tall, and just began its journey from Edmonton, Alberta to a nearby suburb on the backs of specialized trailers towed by diesel commercial trucks. Behold the amazing sight of this enormous convoy. There’s a big project underway in Canada called the Heartland Petrochemical Complex, and its purpose—according to Inter Pipeline, the company building it—will be to “convert locally sourced, low-cost propane into 525,000 tonnes per year of polypropylene” plastic. Yes, “locally sourced” is a term now being used for plastic. Viralhog, who posted the video above to YouTube, writes in its description that the short journey began on Sunday night and will take four days. Canadian news site CBC’s details the full route, and quotes the Alberta government as saying the splitter is the “heaviest load ever to travel on Alberta’s highway network,” and that—including all vehicles involved—the operation will span almost 590 feet in length, over 31 feet in width, and over 42 feet in height, taking up both lanes and the shoulder of a two-lane highway. It’s hard to tell exactly which trailers are being used, or if they’re self-propelled in any way, but the trucks appear to be Western Star 4900s, which Mammoet mentions on its website as among the prime movers it uses for such operations. And what an impressive operation it is. Unless you’re stuck in traffic because of it, in which case, perhaps “impressive” isn’t the right term. The Heavy Duty Stuff Needs to Get More Credit, Doesn't It?